To be empowered is not necessarily about moving through the world powerfully displaying our magnificence for all to see and know. Rather, it can be about a process of simplification. Relax into a life of ease. Be empowered in your daily movements. Embrace the simple things. Find the source of your greatest wisdom and power. It doesn’t need to be so complicated. Right now, wherever you are, breathe. Take a deep breath. And another. Check in with your body. Check in with yourself. Simple doesn’t mean there’s no work. It just means we take our ego out of it. Bigger isn’t always better. (WHAT?!?) I mean it. And then again, sometimes simple is very big. 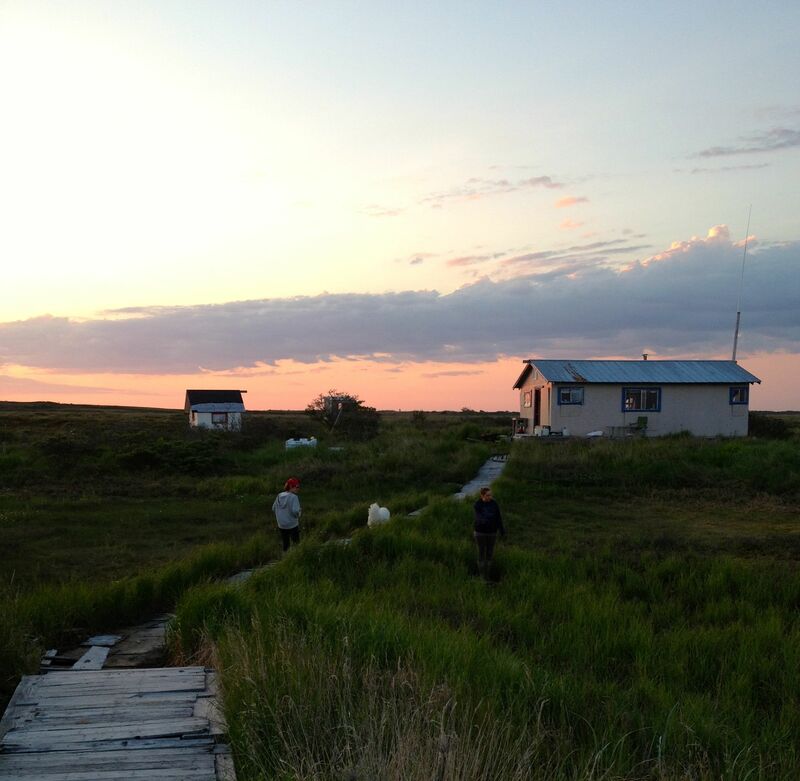 On my annual migration to fish camp in Bristol Bay, Alaska, I am reminded that when we strip away all of the modern “conveniences” we often expect and rely on, we create space for a different kind of wisdom and power. What do I mean by this? At fish camp there is no electricity except from a gas-powered generator that we start up as needed. There is no cell service for my smartphone. We work with the tides (which we don’t schedule). We haul water from the pond in 5 gallon buckets for washing up. We have to fly in whatever food supplies we need. When I’m in this environment, it takes a few days of “detox” before I can relax into the rhythm of life at fish camp. But the weirdest thing happens. My health and fitness improve rapidly. Without me making any conscious effort, I get stronger. My lung capacity improves. My hair and skin look better. I sleep more soundly. (I sleep well!) And I start to notice within the first week I’m there that I am more alert, more easily present, and I have more desire for social connection. This is what stress reduction can do for me. Just imagine how much better I could feel, how much more productive I could be throughout the year if I could maintain this feeling, this state of health and fitness — emotional and physical? And then it hit me. Today as I was reflecting on what the fish camp experience really offers me, I realized it’s that I don’t fight it. I don’t try to control everything about it. I am simply present. Simply. Available for any task at hand. Ready to work. Ready to play. Ready to connect. Preparing for the next tide. I relax into the rhythm of the unknown. What if we embraced the idea that life, just like an ocean tide, isn’t something that we are responsible for controlling at all points? We can’t control the size, speed, or strength of the tide. It is what it is. All we have control over is our preparation for and response to it. That doesn’t require checking Facebook or Twitter every hour, going to the gym at the same time every day, using a specific brand of anything. It doesn’t even require eating only local organic foods. It means we are willing to go with the flow. Such a willingness, our openness, gives us incredible strength. Adaptability. It’s what keeps us alive as a species. It’s part of what empowers us as individuals. I have a brilliant friend and coach, Gini Martinez, who talked to me this last week about the body’s ability to store and utilize potential energy. I like to think that by relaxing into the natural flow of things, I’m able to gather more potential energy. By not fighting what is, I can actually increase my energy flow. So relax into the simple things. Dishes. Laundry. A walk. Setting up Monday’s conference call. (Yes, it can be simple.) Notice what it feels like for you. Breathe. (We store fear in our bellies, so you might want to take a few more deep breaths.) Notice where you might be resisting a life of ease. Breathe into it. Know that you have great energy and wisdom within. When we clear some distractions, it’s easier to know this. What helps you to feel your own energy and power, to hear your own wisdom? Comment below or email amy [at] amyrootvik [dot] com. I’d love to know your story. taking my deep breaths and letting go ..at the beginning of this day. I ‘love’ the tides and treasure our Alaska experience . Thanks for sharing so perfectly!